EMPOWER YOURSELF to BE AGELESS! Open yourself to new knowing, ancient truths, insights, practices, tips & tools you’ve been seeking, and the inspiration you’ve been craving. Blending intimate storytelling with our collective stories, historical insights and cutting-edge new models and provocative ideas into a powerful resource and radical new vision for women of all ages to guide you to live beyond time, beyond age. I am here to guide you on The Ageless Way. Watch the Video. Read the Book. Get Turned On. Live in a State of Agelessness Every Day. Lead in the Aging Space in Your Sector. More of us than ever before are ready to reshape the chaos of our lives and planet, to change what aging means for our future, while transforming our lives, and our world. The old story of aging no longer applies – if it ever did. We have more to give, not less, with each new year. Why deny age when we can transcend it? We can live beyond time, beyond age. We can be Ageless. Join me in an exploration of past, present, and future stories, from the ancient oracles to modern trends in everything from entrepreneurship and the economy, science and technology, health and beauty, community and politics-stores and trends that lead to one extraordinary conclusion: We are on the cusp of the new story of our Age, as individuals, as leaders, and as a planet. It is a story in which multiple generations have an opportunity to redefine age and reimagine the future together, and in dosing so, transform the world in visionary ways. It’s time for us to illuminate this new story about what it means to age across our life course, and across the globe. Our new story is one in which we step forward to be not who we should be as we age, but who we can be. Let the old story go. Let the new story begin. 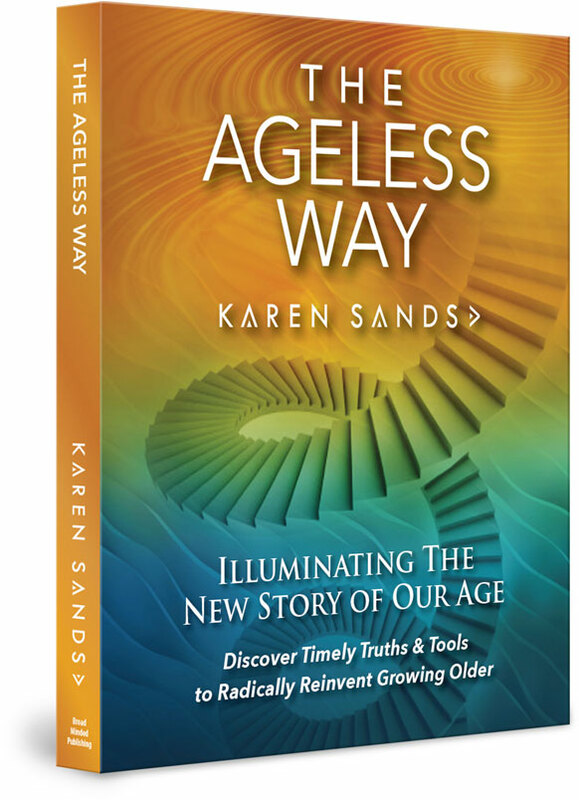 The Ageless Way is being called an evergreen resource and reference guide for all ages and through the ages. It is a book which you will return to again and again…not only in regards to your own life, but to better understand how every gender and every generation can co-collaborate to change the future entirely.Because aging is not about who we think we should be…it’s about who we can be. If you want to be free of whatever is holding you back from true Agelessness, so you can start living and leading as an Ageless Visionary with Wrinkles (you know she is within you) reaping the rewards of staying in sync with yourself and those who keep you rockin’ your Age! Your story is not over. In fat, it’s only just beginning. The Ageless Way is your personal invitation to make it a new story worth sharing. Enter your Name, Email eldress and Amazon order number below & receive instant access to the bonus gifts! BONUS GIFT: The Gutsy Gals Guide To: Courage, Risks & Rewards DIY Coaching Program. Trainings with exercises. You will explore 5 key areas that will help you: Find the courage to take new risks and reap great rewards, look at risk from different perspectives, explore how the rewards for taking chances far outweigh the costs. Value=$97.00. Debbie Sodergren is an Author/Speaker and owner of Up Vibrations, LLC. Debbie graduated from the New England School of Metaphysical Studies in 1998, is nationally certified as a Reiki Master Teacher and is certified to teach Metaphysics and Meditation. BONUS GIFT: Here is a FREE gift, valued at $97, from me, to you I want you and your family to experience the best of the holidays and being together. Learn NOW how to set up a meditation space in your home and learn my simple quick technique to calm your emotions and empower you to go forward in your life with peace and gratitude. These 2 quick videos will make all the difference in enjoying your family. BONUS GIFT: 7 Day Queen Up Challenge. If you are searching for confidence, direction and clarity, your Inner Queen is waiting! Learn the secrets of personal “alchemy” so you can forge your OWN PATH to love, success and happiness. Transformation tools, recorded meditations plus bonus audios Value= $97. BONUS GIFT: Intrigued? Start here: take my “New Directions Quiz” to assess where you are now, and what you may want and need to create the best for the next exciting chapter of your life! -What your choices are when it comes to office space. -What the pros are to each space. -What the cons are for each space. -Who you can talk to if you need help making a decision. BONUS GIFT: Jump on my website now to grab my download entitled “5 Ways to Cultivate Confidence”. I am excited to share it with you! I trust you will use the ideas inside to grow your confidence and then share my tips and my website with a friend! Enjoy! As an artist and gratitude coach, Terza empowers you through creativity, gratitude, and mindfulness. She has created powerful tools for daily use – gratitude texts delivered to your phone, empowerment papers to restore personal power, and art to restore your creative senses. Because you are most powerful when you are in love with your own life. BONUS GIFT: How would you like to celebrate yourself, your friends, and your world, every single day? These texts are a shot of gratitude adrenaline delivered every morning to your phone. The first 30 days are free! Then it is just $3/month (less than a cup of coffee!) to subscribe. INFUSE your entire day with gratitude! BONUS GIFT: Our transformative audio recording, “7 Keys To Growing Ageless” a step-by-step guide to help you embrace and celebrate your “third act” years! We also invite all to join our Italy Sweepstakes campaign on Facebook! BONUS GIFT: Health tips as in nutrition, group therapy, psycho therapy, physical fitness, natural supplements intake. Cost varies. Live Life to the fullest with the help of the award winning radio show that brings you the resources you cannot do without. Host Adriane Berg and her battalion of experts come to the rescue to bring you the “Fountain of Truth” about aging. BONUS GIFT: Ask a question and get an expert answer, and get a FREE download of my latest book: “F.E.A.R. Factor: 15 Minutes to Your Ideal Retirement” written with financial advisor Ron Gelok. BONUS GIFT: RightConversations is a practical approach for effective communication between you and your loved ones. The tools included in our guides offer the opportunity to build a strong foundation to reduce caregiver distress while helping loved ones remain in the comfort of their homes. BONUS GIFT: In 20 minutes you can learn how to Shatter Your Self Sabotage Cycle to Stop The Negative Thoughts That Hold You Back From Living Your Heart Centered Passion! BONUS GIFT: Today is your someday! Start living the life you have yearned for… To get you started on your way with gratitude, I offer you this eBook, Fifty Shade of Greatness, the Secret to Living life “ALL IN”. My gift to you, download (its free) today and begin your journey to your greatness…. BONUS GIFT: Soulful Sales Template: A step-by-step system to attract more clients & money without feeling phony! BONUS GIFT: What image are you creating? Do people see the person you want them to see when they meet you? I will help you meet your goals and be the person you want to be. Start with my offer of a 3 hour closet review. This is a $450 offer your cost $300 you receive a free hour image analysis with your scheduled appointment. BONUS GIFT: Download: “Waking Up To Your HappyTruth™…in 3 simple steps” – powerful report igniting a fresh authentic perspective of the most impactful place to stand as a leader. The steps shared are paramount when it comes to your HappyTruth™ (defined as “true alignment of soul and desire organically expressed as authentic happiness”). Priceless in value. BONUS GIFT: Get started on your raw food journey with one simple way to incorporate raw food into your diet!!! Start your day with a green smoothie every morning and feel energized! Not only do they taste delicious but you’ll LOVE the new combinations! Click here to claim your gift. BONUS GIFT: My free ebook, Your Passion to Prosperity Path, guides you from identifying your strengths to finding satisfying, enjoyable work that matters to you and to the world. And along the way, you grow into the kind of person and the leader that you always wanted to be. BONUS GIFT: Two meditations, set over relaxing music, are just what you need to quiet your mind, relax your body and close off your energy leaks so that you can feel refreshed and rejuvenated. In just a few minutes a day you can give yourself an easy and enjoyable gift of self-care. BONUS GIFT: Download my album, art•i•facts. BONUS GIFT: What is your unique destiny and how are you working towards achieving it? Don’t worry, most people are not aware of their Soul’s desired destiny. Robin Clare is uniquely qualified to give you this information through her highly regarded Soul Plan Program™. Let’s start the conversation with a FREE 30-minute phone session! BONUS GIFT: THE PERSONAL FUTURES WORKBOOK. an interactive PDF available in English, Spanish, German, Japanese, and Xhosa. The workbook is designed to be used with IT’S YOUR FUTURE…MAKE IT A GOOD ONE! but considerable information is available about Personal futures is on the website. A description is found on the Home page, www.personalfutures.net. BONUS GIFT: FREE 30-minute design and/or branding consultation (valued at $60) and a free digital download of one of my visionary artwork pieces from my “Magnetize Inspiration” collection (priceless for your heart & soul). BONUS GIFT: Free 15-minute consultation on your writing project and needs over phone or Skype PLUS sample edit of 300 words or less. BONUS GIFT: The Ageless Way Facebook Group – Join my trailblazing Facebook group to continue our conversation on the future of women, the future of aging and our role as Ageless Visionaries, Change Makers and Word Shakers wending our way on the Ageless Way! Let’s Rock our Age in the Longevity Economy. Make waves and lead by example. Be part of our tribe.